How Your Body Weight Relates to Heart Disease and What YOU Can Do to Prevent It. We do not necessarily notice it, but as we age our metabolism slows down which makes it easier to gain weight. Unfortunately, as the pounds increase, so does your chance of having health problems such as heart attack, stroke and diabetes. Being overweight is the most negative factor on your overall heart health. There is a difference between being overweight, and being obese, and both can negatively impact your heart. If you are overweight, you to have an evaluation performed to see where and how you carry your extra weight. 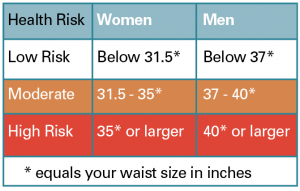 For example, if you have a larger waist than what is recommended, as opposed to carrying your weight around your hips and thighs, you are at a higher risk for heart disease. It is also important to have your Primary Care Physician evaluate your cholesterol and triglyceride levels as well as your blood pressure. If you smoke, it is recommended that you stop. If you fall into the obese weight category, it is imperative that you lose weight to reduce your risk of heart disease. Obesity can be a time bomb. That excess fat is the leading cause of heart disease and hypertension, as well as some cancers. Losing just 10% of your body weight can have a positive impact on your risk. In addition to that, you will improve your blood pressure, your cholesterol levels and your blood sugar. Your entire cardiovascular system will benefit. Why and how all of this takes place in your system is complicated, but any excess weight is bad. Excess weight around your middle is worse. Losing weight is one aspect of that process that YOU can control, and WE can help. To discuss your health and any possible risks, schedule an appointment with your Primary Care Physician. We are here to discuss the options that are available for you and what will work best for you. (For more information see our newsletter article, inter 2015).